The structure of classical Indian music dates back several millennia. During the medieval period Hindu and Muslim cultures fused in North India releasing a remarkable period of creativity in the arts and architecture. Music developed an unparalleled character, depth and sophistication under the patronage of emperors. The Hindustani music we hear today was further developed by Ustad Allauddin Khansahib, the father of Ustad Ali Akbar Khansahib, who was schooled in both Western and Hindustani music. In old times, there were no written records of music notation in India, only the words of the songs. 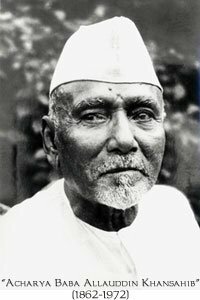 After learning Western classical music notation when he was young, Baba Allauddin Khan created a system of notation for Indian music that is still used today. He also went on to invent orchestral compositions in classical ragas with harmony, which was new to India.